← The Adventuresome Life of Pinot Peanut Potter…..
Below are the definitions of a couple of words from the title you’re probably not familiar with, as I wasn’t before. Since my last post was about kittens, it only seems fair to give puppies equal time. That, and the fact we just got a new one to entertain us and our other two-year old Cavachon. Which obligates me to introduce the furry friends that keep my life interesting. If you don’t count getting up at all odd hours of night in freezing cold temps to house train, it’s just about the greatest thing imaginable to have a playful, wide-eyed, innocent little being running about and lavishing one with unconditional love. There’s a whole new world for “Sadie” to explore and no adventure too daunting to not be undertaken immediately upon its discovery. Until, that is, a sudden sound or blowing leaf compels her to beat a hasty retreat to the solace of her master’s feet. Also at play are no less than thousands of generations of genetic multipliers, urging Sadie to employ myriad sneak attacks on her older and much larger sibling, “Bella.” In fact, it appears her very self-worth is predicated on how much she can aggravate the poor unsuspecting pooch. But it’s good fun and Bella has quickly learned to give as good as she gets. But back to the title. You’ve probably heard that pets, especially dogs, tend to increase life expectancy. Frankly, I can’t imagine my life without a dog in it. To me, they are that jewel that transforms our spirit from taking ourselves too seriously to experiencing the all out joy that life can offer. If we’ll just let them, they will teach us much about life in general. In fact, Sadie just reminded me about one of the important things I should do every day, so I must close. 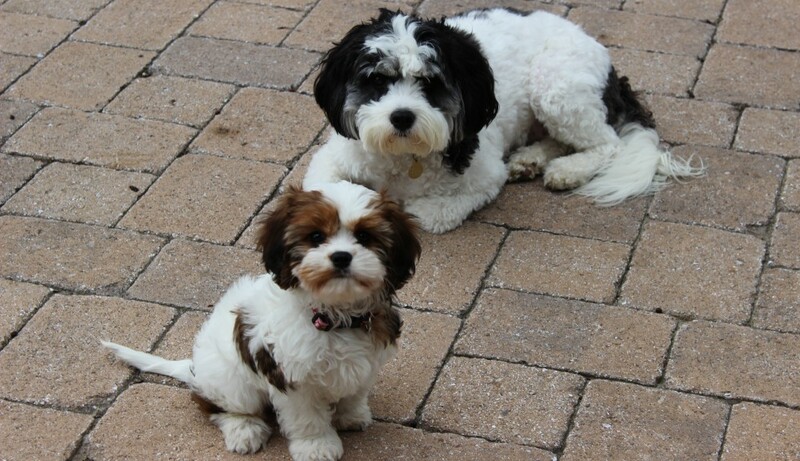 This entry was posted in Family and tagged Bichon Frise, Cavachons, King Charles Spaniels. Bookmark the permalink. 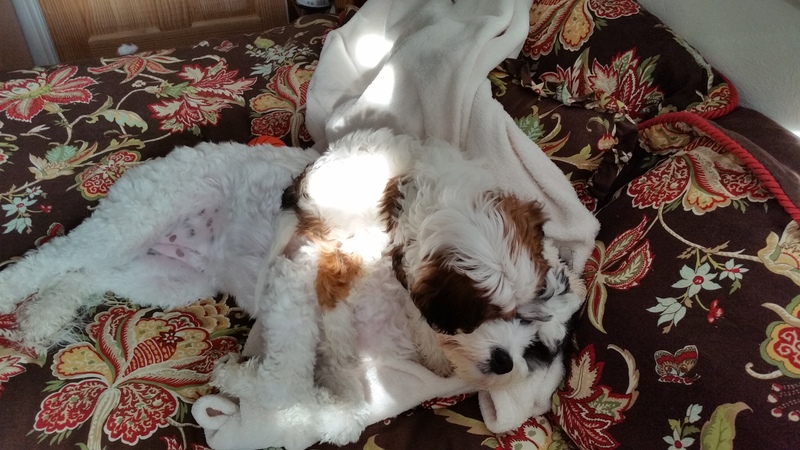 23 Responses to Cavachons or cabochons…..or both? Pingback: What type of dog? What breed do you think is the best? | Francis's Blog: "Pets and Animals." Settling down for a long winter’s nap? Love the new pup! Congratulations. Yes, ducks, they are already settling into a routine of sorts. The older one has taken on much of the training duties, leaving us to just look on and ponder our brilliance. Will you hate me if I tell you that I’m familiar with the latter word in your title? Yes, I’ve used the word ‘both’ many times. But I have heard of ‘cabochon’ because I’m an avid reader of Georgette Heyer, who uses it upon occasion. Who knew historical romance (albeit superior historical romance) would come in so handy one day? Damn. I should have known the Manchester grammar police would nail me on that dangling modifier! Anyway, putting aside your erudite vocabulary, you are the 3rd person this morning from England to wish me a Happy Thanksgiving. Being the skeptic that I am, I’m wondering if you’re all glad we did leave. You have a secret holiday over there celebrating the day we got on the boat, don’t you? What day is it? You can tell your old pal, Al. Why, Al, it’s Thursday here. What day is it there? Call me a cynic, but it won’t be long before we Brits begin celebrating Thanksgiving, you mark my words… We steal everything from you colonials, eventually. Or to put it more accurately, we take back what’s rightfully ours, like, um, democracy. Yeah, democracy. We started it. After the Greeks, that is; but we don’t take the Europeans seriously so they don’t count. Enough babble! Enjoy your day! I think it’s an attempt by me to enjoy vicariously , the innocents and unbound energy and enthusiasm of youth. I’m wearing my emotions on my sleeve with Sadie. And did I mention my next blog will have cream colored ponies and crisp apple strudel? And doorbells and sleigh bells and schnitzel with noodles? And bright copper kettles and…..well, you get the idea. Just trying to warm you up from all that snow and cold up there. My work here is done. kitties…puppies…what’s next, Al? Poems about holding hands on the beach at sunset? I knew what a cabochon is (I believe is is actually used to refer to a gem that is rounded on the top, as opposed to faceted), but I wasn’t familiar with Cavachon. Those two sure are adorable. Blogging rule #1, Peg, if you’re having writers block, go straight for the reader’s heartstrings with something gushie. My next post: walking kittens and puppies on the beach while holding hands at sunset (thanks for that one). 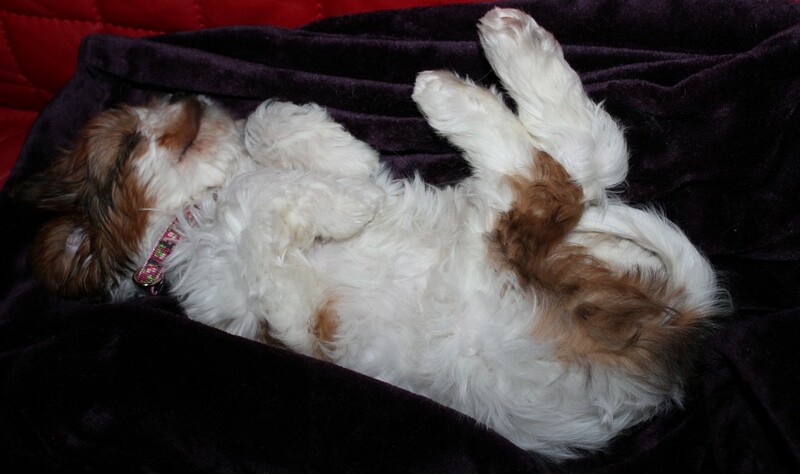 Sophie (and Bella too): adorable, and truly a gem. We would have more money and less hassle without them, but our hearts would be empty. I truly do not understand people without dogs. Offhand, I can’t think of money better spent, Dianne. In all these decades as a dog owner, I’ve never had one that didn’t gladly listen to all my problems with a sympathetic ear. I have 6 dogs . Two are elderly so no problem at all but the other 4 make up for it. I am not so sure about sailing off into the sunset stuff but as much trouble as these four are I do think it would be very hard to give them up…so they stay! I think I must love my dogs! We are blessed souls indeed to have these animals in our lives.